Early barkers can head out to Leesburg for the dog swim at the AV Symington Aquatic Center in Ida Lee Park on Sept. 7 from 10:00 a.m. to 2:00 p.m. About 400 dogs attend this event each year! The pool is at 80 Ida Lee Drive Leesburg, VA 20176. The event is hosted by Leesburg Dogs, Inc., and proceeds will be used towards the Leesburg Dog Park at Olde Izaak Walton Park. Rules: Admission is $5.00 per dog; limit 2 dogs per family. Children under 8 will not be permitted, due to rambunctious pet play. 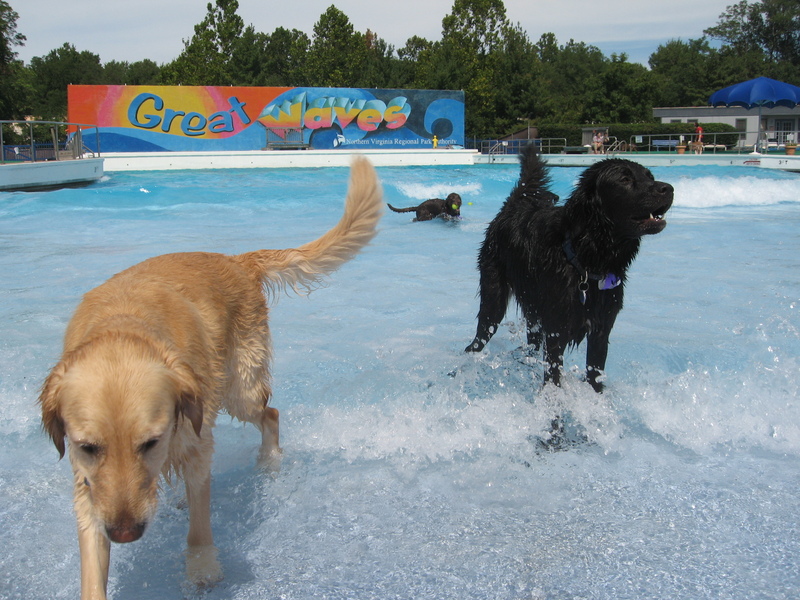 From 10:00 a.m. to 2:00 p.m., all five of the Northern Virginia Regional Parks Authority water parks are welcoming pups to paddle on Sept. 7. This is one of my particular favorites, especially if you have a dog who doesn’t like to jump in the water. The Alexandria Great Waves park has a step-in wave pool with a “beach,” so dogs can easily get in and out, and you don’t get that crowd near the stairs like at regular pools. Plus, there’s a huge astro-turf covered area for them to run around on. It’s a less-stressful environment than some of the dog events. Cost is $5 per dog. Download the flier for more information and the Assumption of Risk form. Even if they don’t say it on their websites, most of these events require proof of vaccinations, so make sure you have your dog’s tags or a copy of the certificate. Bring cash and a check, some don’t take credit cards. Treats probably aren’t a good idea, since there will be a lot of dogs at these events. And most of all, bring towels to transport your wet, tired pup home! « We’re going to dog camp!